Calculate the amount of gravel and sand needed for the base for a paver patio, path, or driveway project. Enter the size of the project and desired depth of the base materials to get an estimate of gravel and sand required. How Deep Should a Paver Base Be? A beautiful and long-lasting paver patio starts with a solid base. A paver base consists of a layer of crushed gravel topped with a layer of sand. A solid base will prevent the pavers from shifting, sinking, and upheaving. For a typical patio, a paver base should consist of a 4″ layer of gravel with a 1″ layer of sand. For heavier duty applications such as commercial spaces or driveways a 6″ to 8″ layer of gravel should be used. 50 sq. ft. 0.62 cu. yds. 0.15 cu. yds. 100 sq. ft. 1.23 cu. yds. 0.31 cu. yds. 150 sq. ft. 1.85 cu. yds. 0.46 cu. yds. 200 sq. ft. 2.47 cu. yds. .62 cu. yds. 250 sq. ft. 3.09 cu. yds. 0.77 cu. yds. 300 sq. ft. 3.7 cu. yds. 0.93 cu. yds. 350 sq. ft. 4.32 cu. yds. 1.08 cu. yds. 400 sq. ft. 4.94 cu. yds. 1.23 cu. yds. 450 sq. ft. 5.56 cu. yds. 1.39 cu. yds. 500 sq. ft. 6.17 cu. yds. 1.54 cu. yds. 550 sq. ft. 6.79 cu. yds. 1.7 cu. yds. 600 sq. ft. 7.41 cu. yds. 1.85 cu. yds. 650 sq. ft. 8.02 cu. yds. 2.01 cu. yds. 700 sq. ft. 8.64 cu. yds. 2.16 cu. yds. Next Step – Estimate how many pavers are needed using our paver calculator and estimate the amount of polymeric sand needed using our polymeric sand calculator. 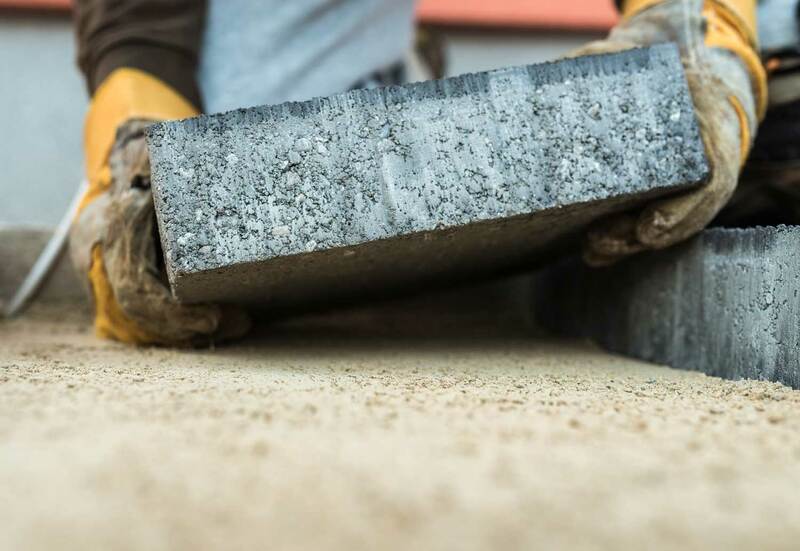 These deck and patio installation how-tos, inspiration, and estimation tools will set you up for success on your paver or concrete patio installation project. Are You Planning a Patio Project? Get hassle-free estimates from local patio professionals and find out how much your project will cost. Estimate how many bricks are needed by entering the size of the wall and selecting the size brick being used. Learn how to calculate brick material. Calculate concrete needed for a slab, footing, post, patio, or other masonry project and find the concrete cost. Estimate how many cubic yards and bags of concrete fill a space.